Greek mythology is the most focused on different niches of art and the entertainment business across the globe. Online gaming software developers have tapped into this part of history for the creation of tens of games, whose popularity has been as widespread as that of the stories they are based on. One of the most focused on characters in these myths is Zeus, who serves as the inspiration for the creation of the William Interactive slot focused on in this review. The Zeus slot machine is based on the ancient Greek god with the same name. Zeus has numerous myths surrounding his origin and life, but one factor that remains constant in all of them is that he reigned supreme over all other Olympian gods. This powerful god was born to the Titans Cronus and Rhea, the former being his father. When Zeus came of age, he overthrew his father and took over as the supreme being in all of creation. He granted his brother Poseidon power over the seas and waterbodies while Hades maintained power over the underworld. Zeus became the ruler of the skies while becoming king of the Olympians with full control of Mount Olympus. 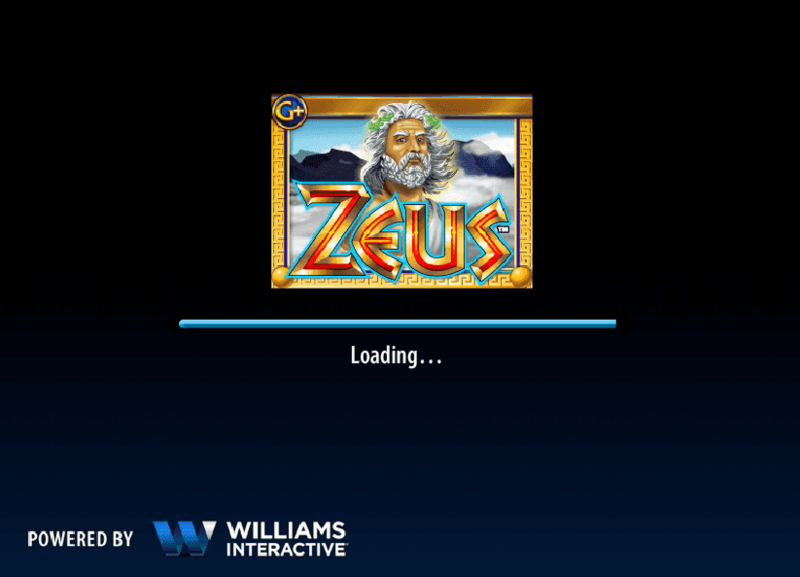 Players get to interact with this almighty god on five reels in the slot machine Zeus developed by Williams Interactive. Numerous other slot machines with this theme can be found online with better presentation than this WMS slot. Even so, the set offers adequate entertainment value that makes it worth a spin. The playing grid in online Zeus slot machine, which carries thirty bet lines, is built to look like strips of cloth with simple embroidery patterns on the edges. Considering Zeus is the god of the skies, gameplay takes place high above as one can tell from the backdrop. A clear blue sky is spread all across the Zeus slot machine screen with a few cotton clouds here and there. The Temple of Olympus sits atop the reels in a majestic gold shade with two marble pillars placed on each side holding up golden bolts. Simple graphics and animations that match the time of the slot’s release are used, which qualify it for a retro title in comparison to those used by WMS and other software companies today. Simplicity is also reflected with the lack of background music aside from when the reels are in motion. Even then, soft tunes are used with a flat tempo that remains that same throughout the Zeus slot machine game unless a winning combination is landed. Williams Interactive is not only a big name in the online gambling business but is also recognized as an influential force for the course taken by the industry today. The online gaming software developer is especially recognized for its introduction of the use of slot themes alongside IGT, which added a new dimension to slot play. This new development made the casino game category more popular than it was and gained WMS an even bigger market. The firm was also the first to introduce the use of mini-games within the main game that used multiple lines and coins. By 2012, Williams Interactive had vested interests all over the place and was making a name for itself mostly in the mobile and social gambling platforms. Looking at free online Zeus slot machine now, it may appear as an average slot game, but WMS has continuously grown with time to become the big name it is today. The release of free Zeus slot machine online was at the time ahead of its time in terms of imagery and numerous other elements, which is a trend the firm has kept up with to date, which has cemented its place as a worthy competitor for other thriving software companies. On these gadgets, Zeus slots are played in instant play mode that needs no download of neither an app nor flash player. The layout of slot machine Zeus is similar to that of the PC version with no changes applied. The only difference is an adjustment in size which makes it suitable for the small screens used in smartphones. Even with a decrease in size, the option still carries the big advantage of portability which is not enjoyed by the desktop version. Even with a difference in the devices used to play Zeus slot game, the rules of play are the same. Williams Interactive online slots share the upside of having predetermined bet values that make it easier for gamblers to set their stakes. The use of preset values eliminates the need to keep track of the coin values and bet levels used, which can sometimes be confusing. These values occupy most of the UI panel placed at the bottom of the online Zeus slot machine screen and lie between 0.3 and 150 credits. The thirty bet lines of the game cannot be adjusted, which means that they all have to be used during gameplay. The lack of an adjustment option for the play lines in Zeus slot game can hardly be considered a downside since it leaves gamblers with as many chances to land winning combinations. In any typical slot, the characters that adorn the reels are inspired by the theme the game is based on, which is the case with the Zeus free online slot. These icons feature a mix of cartoon and three-dimensional imagery, which is an interesting twist exploited in most other online pokies. These characters include the temple of Olympus, Zeus, ship, Pegasus, helmet, wreath, silver coin, vase, harp, gold coin. WMS foregoes the use of the common poker face cards in this set to make it entirely Greek themed. Wild – The temple of Olympus is the wild in online Zeus slot machine, which means it can play the role of any icon that falls adjacent to it if there is a chance of completing a winning combination or extending it for more lucrative winnings. Scatter – The symbol of Zeus holding up a lightning bolt is the scatter in Zeus slot game, which makes it the free spins trigger. The item is the only one that cannot be replaced by the temple wild. Additionally, the combination of three to five Zeus online slot icons used to trigger the freebies does not have to fall on a bet line or adjacent reels for it to trigger rewards. Zeus free online slot’s paytable adjusts these values depending on the stakes placed. Those displayed above are given for the highest wager of 150 credits. Two Zeus characters award 20 credits. The scatter in Zeus online slot does not offer any credit wins and only offers ten freebies when three or more of them are landed. The freebies are played in consecutive order once they are landed, and the icon values remain the same during the feature. As usual, the coin value used for each spin is similar to the one that landed the feature items. Players looking to explore the offering of Zeus slot can do so on our website where we offer a free version of the game. This demo mode is provided with no registration and is also available in free slot no download mode. When playing Zeus slot game for fun, we offer fun credits that can be used in the placement of stakes similar to the real money version. Those that consider Zeus slot machine worthy of their real money after trying out the free version can head on to a WMS casino and place cash stakes in the game. A real money deposit is required for this version to run. It is advisable to start playing Zeus slot online for free before playing for actual cash to collect some tips on how the game operates and pays. Both modes maintain a constant RTP rate of 95.97%.